This IBM Redbooks publication describes how to use printing functions on the AS/400 system. It supplements the standard reference documents on AS/400 printing by providing more specific "how to" information, such as diagrams, programming samples, and working examples. It addresses the printing function found in OS/400, Print Services Facility/400 (PSF/400), Advanced Print Utility, Page Printer Formatting Aid, AFP Font Collection, and other print-enabling software. The original edition applied to Version 3 Release 2 for CISC systems and Version 4 Release 2 for RISC systems. This second edition includes information about the new functions that are available in releases up to and including Version 4 Release 5. 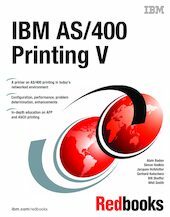 This book is intended for customers, business partners, and IBM systems specialists who need to understand the fundamentals of printing on the AS/400 system. It is designed to help you develop or advise others concerning the design and development of AS/400 printing applications. This book is not intended to replace existing AS/400 printing publications, but rather to expand on them by providing detailed information and examples.